So, I went to the local hobby shop yesterday and got myself and RC Helicopter :) I was originally looking at the Blade CX2 as my first helicopter, and was thinking it would be about $230, but after talking with the owner a bit, he recommended the Blade 120 SR. It has only one set of main blades and a tail rotor, which makes it a bit harder to learn at first than the CX2 (which has two, counter-rotating blades), but after you've learned the basics, you can do so much more with a single-bladed heli. I've logged 6 flights so far with the yellow heli, which came ready to fly with transmitter, batteries, and a charger, which cost me $195 including tax. I only have limited experience with the heli so far, but it seems like a great helicopter. It's 12.5 inches long and 5 inches tall and weighs 106 grams, which makes it big and heavy enough to fly outdoors in a light wind, but small enough to practice in the comfort of your own home. In my 6 flights, I've crashed quite a few times, but the helicopter is very sturdy. The only thing that has been damaged is one of the landing skid struts has broken, but it's staying strong with a bit of electrical tape. I set up my camera in the basement when I flew my 6th flight, so if anyone would like to see it, comment below and I'll upload it to YouTube and post it in this post. My flying skills are slowly improving, and I'm starting to be able to make move the helicopter within smaller spaces. The reason I decided to get an RC Helicopter over an RC Plane, despite the fact that I'm a full-size fixed-wing pilot, is the fact that helis are much more versatile. They can be operated in much smaller spaces than RC Planes, indoors or out, and can do most of the same things. After I become very proficient with the 120 SR, I'll be looking to pick up a Blade mCP X, so that I can move on to aerobatics and inverted flight. I should be making my 7th flight in a little while after my battery recharges (I'm going to buy extras so I don't have to wait while my only battery charges). 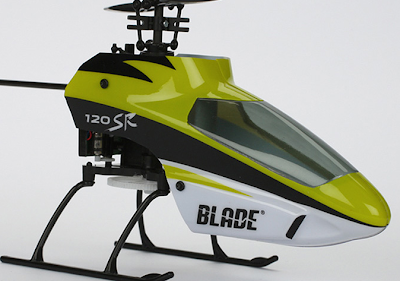 If you want more info on the 120 SR and other Blade helicopters, check out their site: http://www.bladehelis.com/Helis/. Wish me luck on my upcoming flights!